Last year, the Google Pixel stood out for having the best camera on a smartphone by DxOMark. 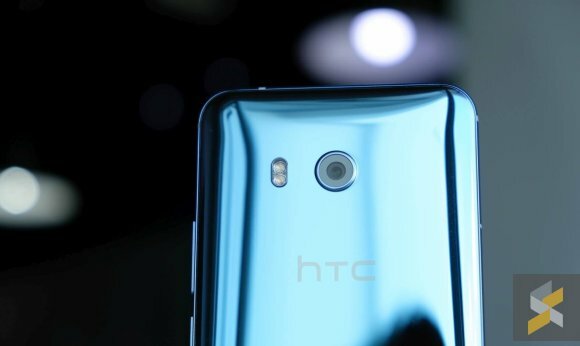 Then HTC took the crown by a hair with its latest U11 flagship smartphone. Both had held their top positions pretty well but now there are two new smartphones that have beaten them to the punch by wider margins. 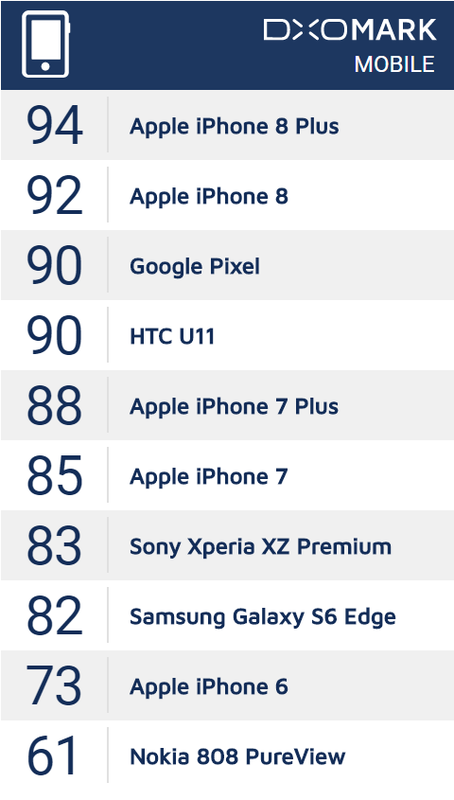 The latest iPhone 8 Plus and the iPhone 8 are now the highest rated smartphones on DxOMark Mobile. 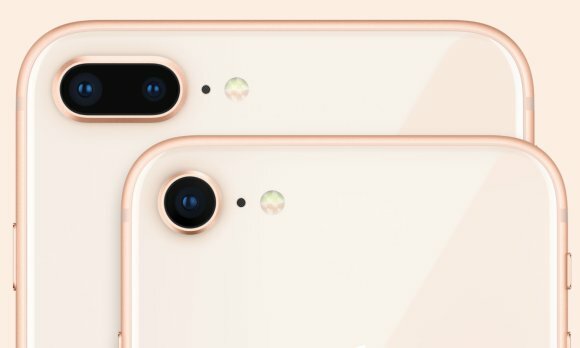 The iPhone 8 Plus scored a new record high at 94 points while the single-camera iPhone 8 achieved 92 points. According to DxOMark, the iPhone 8 Plus is the best smartphone camera they have ever tested and it’s an excellent choice for the needs of nearly every smartphone photographer. They added that it features outstanding image quality, zoom and an industry-leading Portrait mode for artistic efforts. On their review, they praised the iPhone 8 Plus for its HDR performance and for having the best zoom and bokeh on a mobile device. Both the iPhone 8 Plus and iPhone 8 share the same specs as its previous iPhone 7 Plus and iPhone 7 but Apple has introduced newer image sensors that are faster with new advanced ISP. For videos, the iPhone 8/8 Plus can now do 4K video recording at 60fps and 240 fps slow-mo video at 1080p resolution. 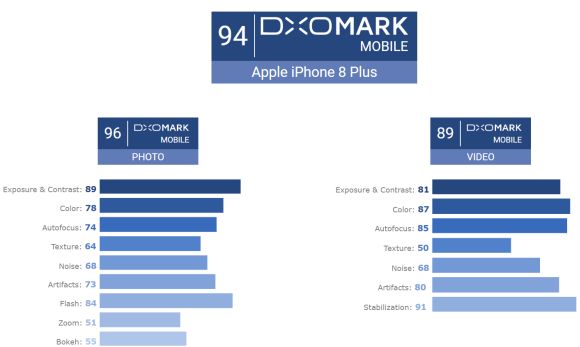 You can read the DxOMark Mobile review for the iPhone 8 Plus and iPhone 8. It is worth pointing out that DxOMark had changed their testing protocols before the iPhone 8 was announced. The original DxOMark Mobile test protocol introduced in 2012 was due for an update and they have introduced new components that take into account the latest developments in smartphone photography. New for 2017, DxOMark is introducing new zoom and bokeh tests. On top of that, they also take into consideration motion in scene and speed of image capture in their autofocus and sharpness test. For low light, they will be taking samples at very low light levels between 1 and 20 Lux for photos and 5 and 20 Lux for videos. Surprisingly, they managed to retest older phones such as the iPhone 7, Galaxy S6 edge, iPhone 6 and Nokia 808 PureView but they didn’t include newer models such as the Galaxy Note8, Galaxy S8, Huawei P10 Plus and the OnePlus 5. What do you guys think? Let us know in the comments below.